Video Here: https://youtu.be/OhzwKUSnYlI On July 28th and 29th, storms and tornadoes whipped through the Oglala community on Pine Ridge Reservation in South Dakota. More than 450 homes were severely damaged by this natural disaster. 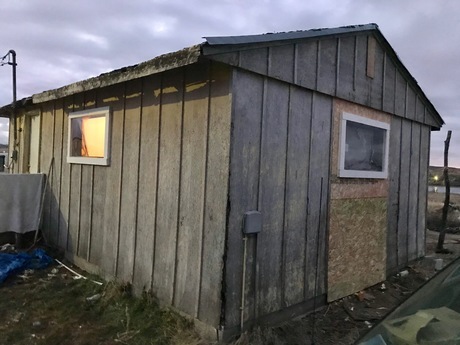 FEMA has denied the Oglala Sioux Tribe Emergency Disaster Funds, leaving hundreds of families facing the winter months with broken windows and holes in their walls and ceilings. Many elderly people, families, and their small children are facing the very real threat of freezing to death this winter if their homes are not winterized and their broken windows are not safely sealed. We are raising emergency funds to seal the broken windows and make other emergency winterization repairs for the homes that were effected by this storm. Our goal is to accomplish this by Christmas. 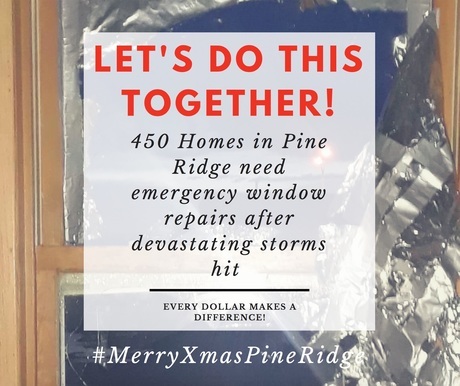 Our plan is as follows: Phase 1: (Dec. 31st deadline for funds, all broken windows to be addressed by Dec. 25th) As we are up against Mother Nature's deadline, the quickest and most effective way to mend the homes this winter will be to provide alternative window options for those in need. Installing completely new glass windows will be over $1.5 million and take many months to complete. Instead, we will seal the broken windows of each home with heavy duty plexiglass so that the warmth within the homes can be retained and families can benefit from natural lighting. In many cases, families have used plywood to temporarily board up their windows, leaving the homes completely dark inside. In some cases, families may need other work done to winterize their homes, such as doors refitted and/or holes patched in walls and roofs. We will work to accomplish this if funds provide. Funding Breakdown: 900 sheets of plexiglass = $9,500 RotoZip Cutters (7)= $750 Ultralight Portable Inverter Generator (2) = $850 Cordless Drills (7) = $800 Screws: $3,900 Ladders (7): = $700 Total Equipment Costs: $16,500 We have allotted extra funds for the needs of the volunteers (veterans, water protectors, construction workers, etc) who feel called to offer their skills and labor. These costs are as follows: Gas, accommodations on the reservation, and food to be prepared by community members: $8,500 TOTAL GOAL: $25,000 Thank you for taking the time to learn about this effort. We would appreciate it greatly if you would share this with your friends and family. Pilamaya! For Physical Donations Volunteer Info And/Or More Information Call/txt: Jackie C - 505.903.4356 sacredhealingcircleinfo@gmail.com If you feel more comfortable making a donation through PayPal, please copy and paste the following link into your browser. 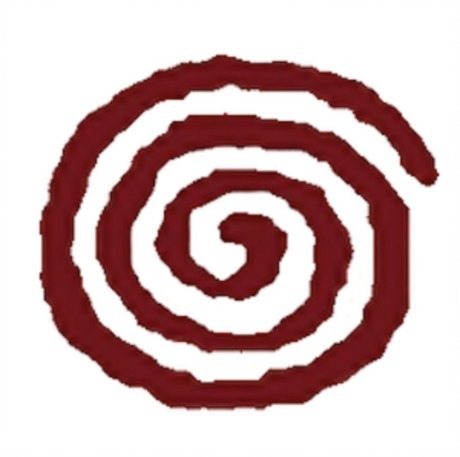 This will lead you to Sacred Healing Circle's direct PayPal.Me page where you can complete your donation. paypal.me/shcprograms Thank you! 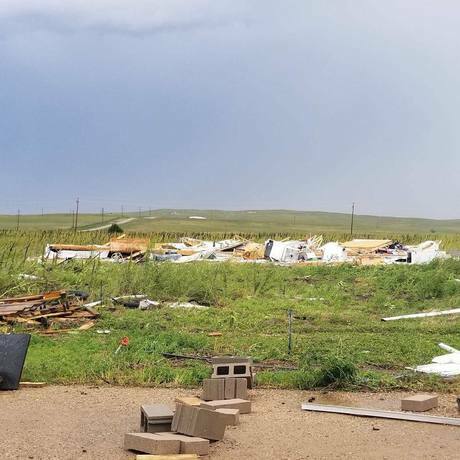 On July 28th and 29th, storms and tornadoes whipped through the Oglala community on Pine Ridge Reservation in South Dakota. More than 450 homes were severely damaged by this natural disaster. FEMA has denied the Oglala Sioux Tribe Emergency Disaster Funds, leaving hundreds of families facing the winter months with broken windows and holes in their walls and ceilings. Many elderly people, families, and their small children are facing the very real threat of freezing to death this winter if their homes are not winterized and their broken windows are not safely sealed. We are raising emergency funds to seal the broken windows and make other emergency winterization repairs for the homes that were effected by this storm. Our goal is to accomplish this by Christmas. As we are up against Mother Nature's deadline, the quickest and most effective way to mend the homes this winter will be to provide alternative window options for those in need. Installing completely new glass windows will be over $1.5 million and take many months to complete. Instead, we will seal the broken windows of each home with heavy duty plexiglass so that the warmth within the homes can be retained and families can benefit from natural lighting. In many cases, families have used plywood to temporarily board up their windows, leaving the homes completely dark inside. In some cases, families may need other work done to winterize their homes, such as doors refitted and/or holes patched in walls and roofs. We will work to accomplish this if funds provide. 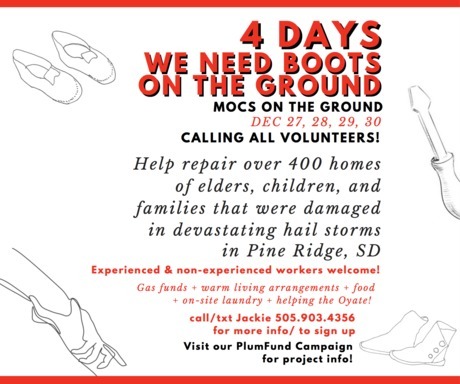 We have allotted extra funds for the needs of the volunteers (veterans, water protectors, construction workers, etc) who feel called to offer their skills and labor. Thank you for taking the time to learn about this effort. We would appreciate it greatly if you would share this with your friends and family. If you feel more comfortable making a donation through PayPal, please copy and paste the following link into your browser. This will lead you to Sacred Healing Circle's direct PayPal.Me page where you can complete your donation. Dear contributors! Tax season is here! As a 501-c3 nonprofit, we are able to offer you a form for your donation to be tax deductible. Please email Jackie C at sacredhealingcircleinfo@gmail.com - she will be able to send you a personalized form with your donation amount for tax purposes. Thank you for your contributions! We would like to thank each and every one of you, as you made it possible to bring warmth to our relatives in the Oglala, Lakeside, and Number 4 communities on the Pine Ridge Reservation! We are not done yet. This first trip was one of many that we will continue to make throughout the coming months. 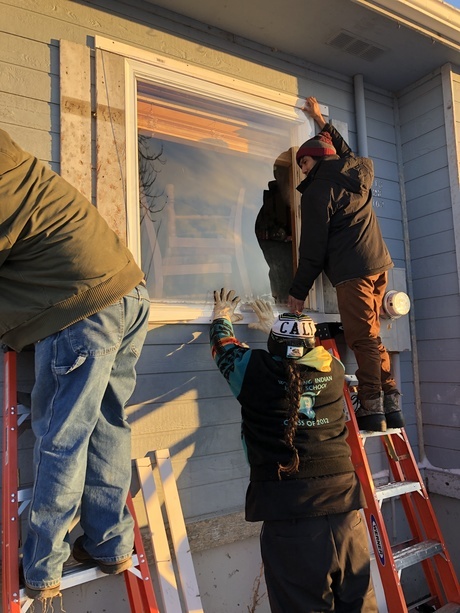 With this first trip, locals and volunteers were able to address 17 homes, fix over 28 windows with plexiglass alternatives, repair damaged walls, provide new storm doors, fix plumbing, and build new stair railings for elders, children, and families. There are many more homes that need to be addressed and we will continue to do our best to keep the momentum of this project moving! Wopila! Our plexiglass windows are looking good! Thanks to everyone who donated to this cause. We are getting rolling and getting faster as we go. Tomorrow we will begin at 9am and go until sun down to address as many homes as we can. The windows are looks great and the People are happy! That's fantastic to hear, hope all goes well and if u need a hand ill see what I can do to help! Because of you, this next part of the project is possible! We're calling out to all volunteers (experienced and non-experienced) to join us in installing these plexiglass windows on the homes of elders, children, and families whose homes were impacted by the storms. Please share this information with those who might be interested. Thank you! When is Phase 2 to begin please? For those who would like to volunteer to get these plexiglass windows into place, we will begin construction Dec 27th and continue through Dec 30th. During this time we will have multiple teams working in different locations throughout Pine Ridge to address the homes effected as quickly as possible. If you or someone you know would like to be on one of these construction teams, please reach out to us. We have teamed up with Henry Red Cloud at his Solar enterprise facilities in near Oglala to house and feed all volunteers who make the trip up to help in these efforts. We can also provide gas funds for those who need them to get here on Dec 27th. You can email sacredhealingcircleinfo@gmail.com or call Jackie at 505.903.4356 to get more information and discuss your arrangements. Pilamayaye! 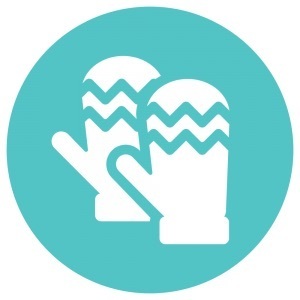 12 pair of gloves in various sizes are on their way! To be delivered on Dec 13-14. Blessings, friends. $500 left till we reach our $25,000 goal TOGETHER! Thank you to everyone who has contributed in the past 24 hours. Your support has been CRUCIAL! Wopila! That is wonderful news! So glad to hear it and how great for everyone to come together. You answered the call! In less than 24hrs we have reached our almost halfway point in this campaign at over $10,000! Thank you! Our goal is to have the Peoples winterization needs met by Christmas, which is only 16 days away. 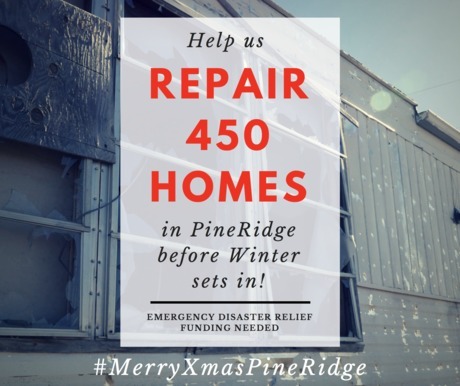 Help us give the best Christmas gifts to our relatives here in Pine Ridge who have been severely effected by destructive storms. Wopila! I am so happy to learn of the success of this effort. It is my prayer that all will be safe and warm. Continue to post needs I will contribute when I am able. Many blessings! 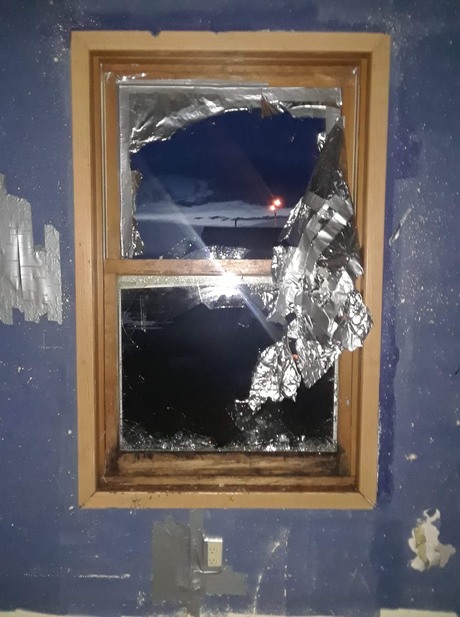 We are only $895 away from raising $10,000 of Emergency Disaster Funds for our Oglala relatives who are in need of repairs to their homes after horrendous storms fled through their lands leaving broken homes, shattered windows, and tattered walls. Winter is here and many are seeking help to repair their homes so they can be warm this winter. Please help us reach this $10,000 landmark on our way to reaching our $25,000 goal! Wopila to all who have shared, liked, contributed funds, and prayed for the success of this project for the People! Wow! 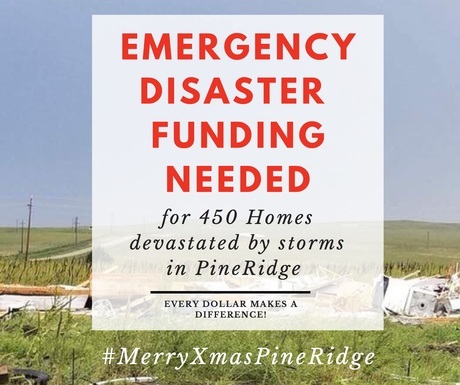 We have reached over $6,000 in Emergency Disaster Relief Funds for Pine Ridge families effected by the storms! We have about $20,000 more to raise before we hit our fundraising goal. Thank you for all your support and please keep sharing this campaign around on the web and through your email contacts - every contribution makes a huge difference! Wopila to each and every one of you who has contributed to this Emergency Disaster Fund so far! Together we have raised over $3,000 towards our funding goal. That means we're at 12% funded, with 88% more to go! Please keep in mind that 100% of the donations we receive go towards window repairs for Oglala families who have been effected by the storms. Please continue sharing the campaign around with friends, family members, and organizations. Thank you. We hope you have a beautiful day! Thank you to those who have donated towards repairing the windows before winter set in! We have raised about $1,000 combining our Plumfund campaign and donations made through Facebook donations. Thank you everyone for continuing to share this campaign throughout the weekend and helping us to reach our goal of $25,000! Debra Edds15 weeks ago Sending warm wishes for all those donating their time to this wonderful project. So glad to have been a small part of it! Elsa Asher15 weeks ago brucha ruach - blessings for a safe winter, I'm sorry it's not more - Mni Wiconi! Iryiel cochran15 weeks ago Blessings to you all. Irene R Remo15 weeks ago Best wishes. brenda v marshall15 weeks ago Best wishes.